Buy Online Now! Classic Evermore Concert Posters and Memorabilia. Evermore started in 1999 consisting of brothers Jon, Peter, and Dann. Jon was born in Australia, while Peter and Dann were born in New Zealand. The three were raised and home-schooled in Feilding, Manawatu. The brothers were introduced to music at a young age by their parents, and frequently listened to their record collection. The name “Evermore” was taken from the Led Zeppelin song “The Battle of Evermore” in 1999. In 2012, youngest brother Dann took a break from playing drums with Evermore to pursue his own singing and production career. He supported the Lisa Mitchell tour in 2012 as Danco. 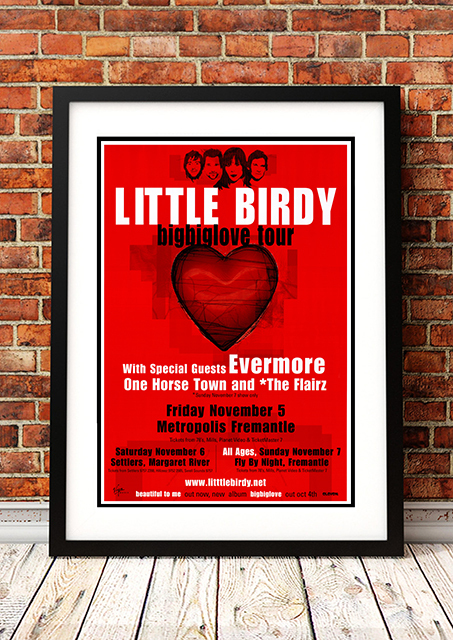 We stock an awesome Evermore Print. In fact, it look like it could have come straight off the press from the original print run. Will look fantastic framed on your man cave, office, bar or living room wall.